Also see Configuring the Message Bank Link, later in this book. For details, see Ensemble Utility Functions in Developing Business Rules. DeleteDeletes the current table. If you have made any edits to the table since opening it, Ensemble asks if you want to leave the page. To delete the table, select Leave Page. If you select Stay on Page, Ensemble treats the current table as if it were a new table. For information on working with lookup tables in programs, see Programmatically Working with Lookup Tables in Developing Ensemble Productions. <Export generator="Cache" version="25" zv="Cache for Windows (x86-64) 2015.1 (Build 378U)"
The legacy format exported by the Ens.Util.LookupTable.%Export() method and the portal in Ensemble 2014.1 and earlier versions does not have the Document element. It consists of just a single lookupTable element and the entry elements that it contains. It can contain entries for multiple lookup tables by specifying different names in the table element. To import such a file as a lookup table, use the Data Import Wizard, as described in Importing Data from a Text File in Using Caché SQL. For the schema name, use Ens_Util. For the table name, use LookupTable. System default settings should specify only the values that are specific to the environment where Ensemble is installed. In contrast, the production definition should specify the values for settings that should be the same in all environments. The production definition. If Ensemble finds a value for a setting here (even if the value is an empty string), it uses that value. If Ensemble finds a value here (even if the value is an empty string), it uses that value. Ensemble uses this value only if there is no system default for the setting. When you configure a production, the labels are color-coded to indicate whether the value was set in the production, the system default settings, or the class definition. See Understanding the Color Coding for Settings for more information. Existing user templates used as dialog windows in Studio must include the Ens_SourceControl.js in /csp/broker/ensemble/ (which can be referenced by the path ensemble/Ens_SourceControl.js) to manage your browser-based interactions. This inclusion is required both for CSP pages and Zen pages. Depending on the context required by your source control hooks, you may need to add some extra data to certain returns. 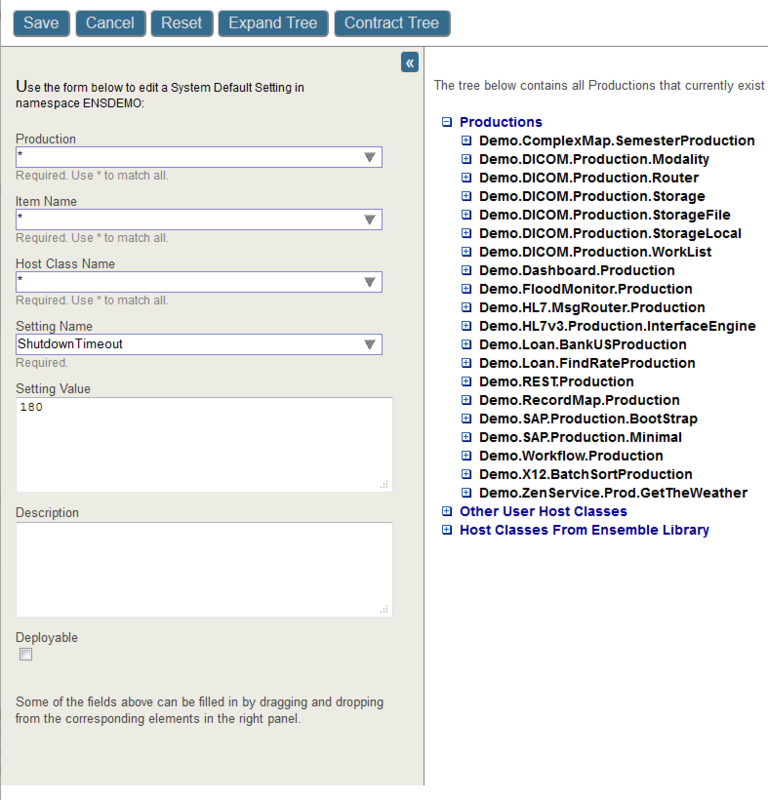 You can configure source control settings for each Ensemble namespace. For information on this, see the Using Studio Source Control Hooks appendix in Using Studio. Also see the Source Control Settings entry in the Caché Additional Configuration Settings Reference.